Based on the larger Mandalorian Kandosii-type dreadnought, a large battleship used during the Mandalorian Wars, the Dreadnaught-class heavy cruiser was designed and initially produced by Rendili StarDrive. While the Dreadnaught proved to be one of Rendili's most successful ships, becoming one of the most produced vessels in recent history, the patent eventually expired. By this time, most major governments and organisations had dozens of these ships in their fleets and a multitude of companies were able to reverse engineer the design. While Rendili StarDrive attempted to stop the continued use of the blueprints, courts across the galaxy ruled against the firm due to the age of the design, making the Dreadnaught a common sight across the galaxy. 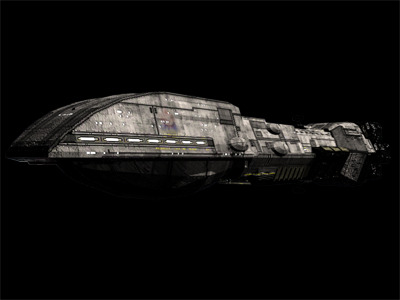 The Dreadnaught-class heavy cruiser was designed to be a as close to a flying fortress as possible. The ships have a strong hull with multiple gun placements, as well as military-grade shielding. With both a hangar and docking bay onboard, as well as large crew facilities, the ship has the capacity to carry a large force onboard for ground assault operations. Despite these positive points, the Dreadnaught has a number of drawbacks, primarily due to the age of the design. While the ship's hyperdrive was cutting-edge technology when it was released, it is now woefully outdated and the Dreadnaught is one of the slowest ships of its class. Furthermore, the size of the ship, and its extensive defences, necessitate a large crew compliment to operate the ship, but upgrades have moderately reduced the crew requirements through the use of slave circuitry. A significant number of these ships have made their way into private hands as governments started selling off their older models, licencing manufacturing groups to use the blueprints, and, in rare cases, selling off the blueprints entirely. As a result, the Dreadnaught-class heavy cruiser was able to find itself a niche market for smaller governments and groups as a way to protect their space and transport troops to hostile zones.